The economy is closely linked with the physical resources that underly it. Most economists assume debt can rise endlessly, just as they assume GDP can rise endlessly. But if there really is a limit that prevents oil supply from rising endlessly, it seems to me that there is also a corresponding limit that prevents debt from rising endlessly. 1. 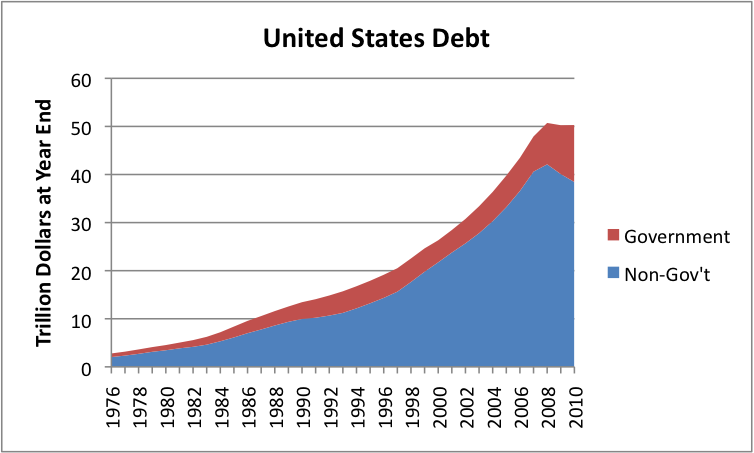 Peak oil tends to cause peak debt. Some will argue with me about this, because they believe it is possible to decouple economic growth from energy growth, and in particular oil growth. As far as I am concerned, though, this decoupling is simply an unproven hypothesis–the normal connection is that a flattening or decline in energy supply causes a slowdown or actual decline in economic growth, and this slowdown causes a shift from an increase in the amount of debt, to a decrease in the amount of debt, as it did for US non-governmental loans in 2009 and 2010 (Figure 1). Figure 1. US Domestic Debt, split between government debt (excluding Social Security) and non-governmental debt. Based on Federal Reserve Z.1 data. Excludes Foreign Debt. Governments try to step in and keep the growth rate in debt up, but the gap is too great for them to make up. This tendency of governments to take on new debt (together with problems related to the original slowdown in economic growth) are reasons many governments have been getting into financial difficulty recently, in my view. 2. Once debt growth peaks (shifts from growth to decline), we can expect a feed-back loop that will tend to make the peak oil decline even worse than it would otherwise be. In the current post, called “Part 1,” I will cover the first of these two issues; I will cover the second issue in Part 2. I have talked many times about the need for economic growth, in order to make our current system of borrowing money, and paying back loans with interest, work on the extensive basis that it is used today. As long as the economy is expanding, as in Scenario 1, businesses feel confident that their future prospects will be better than they are today. As a result, businesses will borrow funds for new equipment and will be fairly confident they can pay back the loans with interest in the future. Governments will also borrow, knowing that they will likely have higher tax collections in the future. Because of these higher tax collections, the governments can expect to pay back the debt plus the interest on the debt. In Scenario 1, even common citizens feel that debt is a reasonable prospect. If the individual loses his/her job, there is a good chance of getting a new one. With prospects for better wages in the future (or at least no worse wages in the future), it makes sense to take out an automobile loan, or a student loan, or even a loan on a new home. If the economy is expanding, promising Social Security benefits to future retirees looks like a safe prospect, as does promising Medicare benefits. Just as a “rising tide lifts all boats,” an expanding economic circle leaves room for more and more types of payments (Figure 3). Figure 3. A growing economy makes allows room for interest and other payments, without crimping budgets. 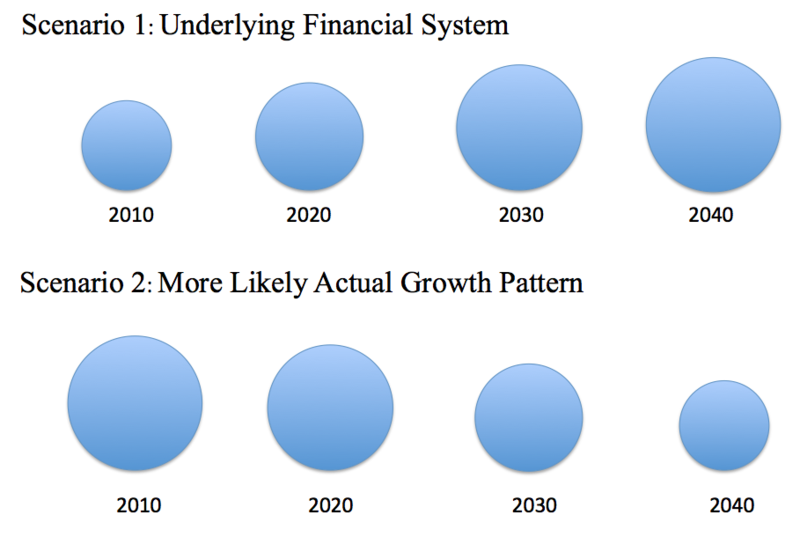 If the economy starts contracting as in Scenario 2 of Figure 2 (or even stays the same size) then it becomes much more difficult to repay debt with interest, and to fulfill promises of future benefits, as illustrated in Figure 4. Figure 4. Paying promises becomes much more difficult after economic decline. Of course, in a contracting economy, there may still be a few instances where debt “makes sense.” These might include very short-term business loans, for example, covering goods in transit. They would also include some business loans where the economic return is high enough so the loan would make “economic sense” even if the interest rate includes a fairly high charge for risk of default (because of the declining economy) as part of the interest rate. This decline in the level of debt becomes a real problem for countries, because the availability of debt tends to add to reported GDP. For example, if a person takes out a car loan and buys a car, the cost of the car gets added to GDP, even though the car is not yet paid for. The availability of debt financing also makes it possible for businesses to obtain capital for expansion, so the business can, for example, build more cars, without waiting for sufficient profits to accrue to have enough revenue to finance the expansion. Both of these activities tend make it easier to increase reported GDP. What has happened in recent years, at least for the US, is that it seems to be taking greater and greater increases in debt to create a given increase in GDP. Figure 5. 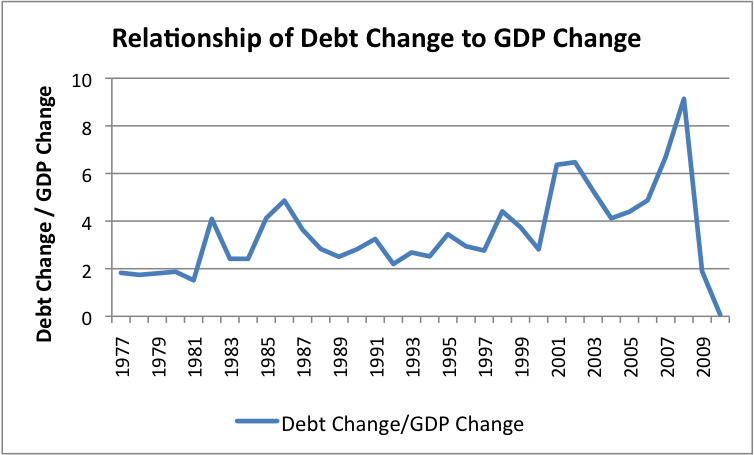 Relationship of change in debt (private and government combined) to change in GDP. This changing relationship may reflect the greater headwinds the economy is encountering, now that oil supply is tighter and oil prices are higher. Oil use, and energy use in general, tends to be tied to economic growth in many ways. Clearly there is a need for oil (or another energy product) to manufacture and transport goods, and to grow and transport food. Given the cars, trucks, trains, and farm equipment currently in use, it is not easy to change the dependence on oil quickly, either. James Hamilton in his paper Historical Oil Shocks has shown that 10 out of 11 US recessions since World War II were preceded by oil price shocks. Charles Hall, Stephen Balogh, and David Murphy have shown that high oil prices tend to be correlated with recession. Robert Ayres and Benjamin Warr have analyzed the amount of work (in a physics sense) that is done by energy of various types. Using this data, they have developed a model explaining the vast majority of US real economic growth between 1900 and 2000, except for a residual of about 12% after 1975. A comparison of annual increases in oil consumption with annual increases in world GDP in constant 2005 $ shows a close correlation. Figure 6. Percent growth in world GDP vs percent growth in oil production. 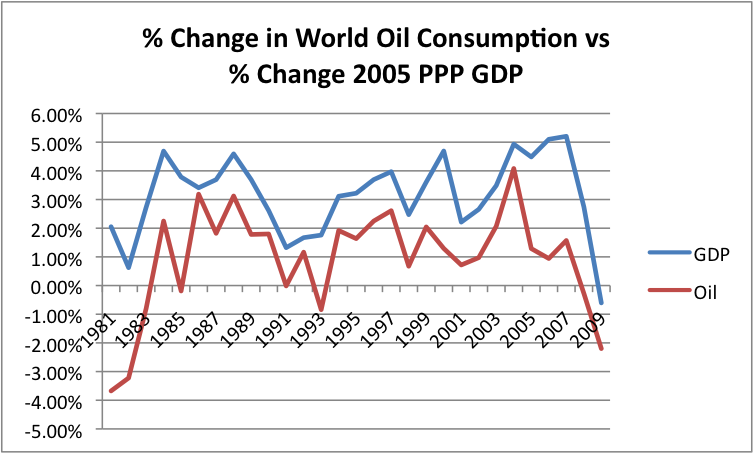 World GDP in constant 2005$ from World Bank; Oil consumption from BP. In spite of all of this evidence, there are some who argue that it is not clear which direction the causation goes with respect to oil supply and economic growth–perhaps the only issue is that the world uses more oil when it is expanding, and less oil when it is contracting. With this belief, it is difficult to explain why oil price shocks would precede recessions, but some economists have learned this view in the past, and seem not to be open to looking at the evidence. There is also a question as to whether we can move quickly away from this close relationship between oil and the economy. Vaclav Smil in Energy Transitions: History, Requirements and Prospects has shown that because of the very large amount of built infrastructure in place, in practice, energy transitions from one fuel to another take a very long time–30 to 50 years. In spite of what Vaclav Smil has shown, there may be some possibilities for short-term decoupling. For example, if car-pooling suddenly becomes much more common, it could tend to change this relationship. It is not clear that such a change would be fast enough, or significant enough, to change the basic relationship, however. Recent debt problems of governments seem to be related to a combination of (1) the tendency of high oil prices to cause recession and (2) the additional debt the governments have tried to take on, to stimulate the economy and to bail out failing banks and other businesses. Part of this debt may be taken on, to try to offset the decline in private debt. In the United States, federal external debt started increasing more quickly immediately after oil prices hit their peak in July 2008 (Figure 7). Even with these huge increases in federal debt, the increase in governmental debt has not been able to offset the decline in debt held by businesses and private citizens, as shown in Figure 1 near the top of this post. Governments around the world have been finding this additional debt burden increasingly difficult to handle. If nothing else, if interest cost of this debt becomes very burdensome, unless interest rates are very low. Furthermore, even when they do try to intervene, their debt doesn’t have quite the right effect–their new debt may buy a new road, but it doesn’t buy a new car for the consumer. This combination of problems–recession caused by limited oil supply, increasing need for government debt because of shrinking private debt and need to stimulate the economy–is likely the cause of the debt problems that so many governments (including the US government) are experiencing today. Many European countries are experiencing problems as well–Greece, Portugal, and Spain, for example. In Part 2, we will look at some of the feedbacks of peak debt that may have an impact on the shape of the peak oil downslope. 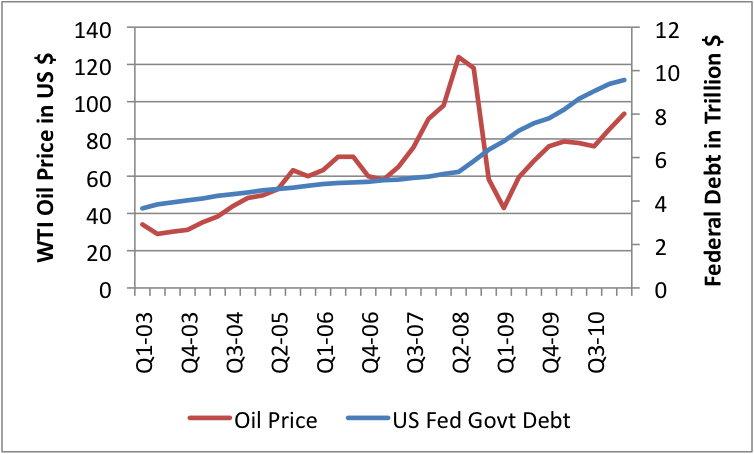 This entry was posted in Financial Implications and tagged Debt, peak debt, peak oil. Bookmark the permalink.